1. Find the last rib of the sow. 2. At the last rib, find the edge of the loin (2.5 to 5 inches off the midline depending on the size of the sow. 3. Liberally apply oil to ensure good transducer contact. Move the transducer around to try to minimize scanning through hair. 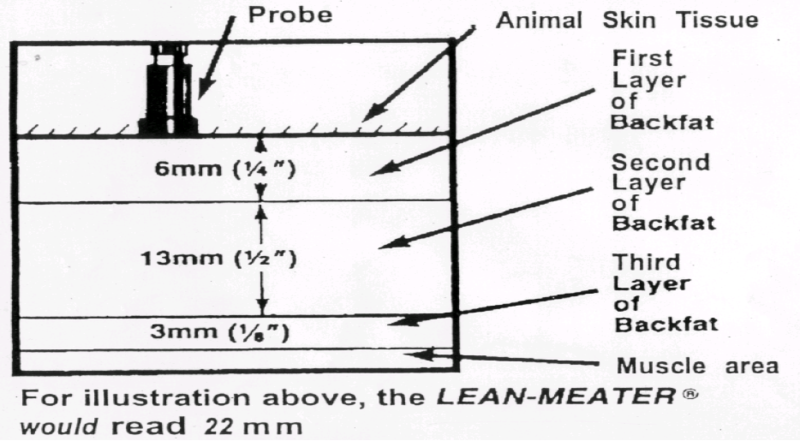 Hold the transducer on the sow until the red light appears on the Lean-Meater. Presence of the red light does NOT mean that this is the final backfat. It simply means that you have made good contact. 4. Slowly adjust the angle of the transducer to make sure you are picking up the third layer of backfat. Remember if you get readings of “13, 13, 14, 13, 18, 13, and 13” as you move the transducer, this sow likely has 18 mm of backfat – this one high reading was where you picked up the third layer of backfat. Remember the probe will not over estimate backfat. 5. If you are concerned about the accuracy of your initial readings, its always a good idea to double check fat depth on the other side as well. 6. Record the backfat and flank to flank measurements. 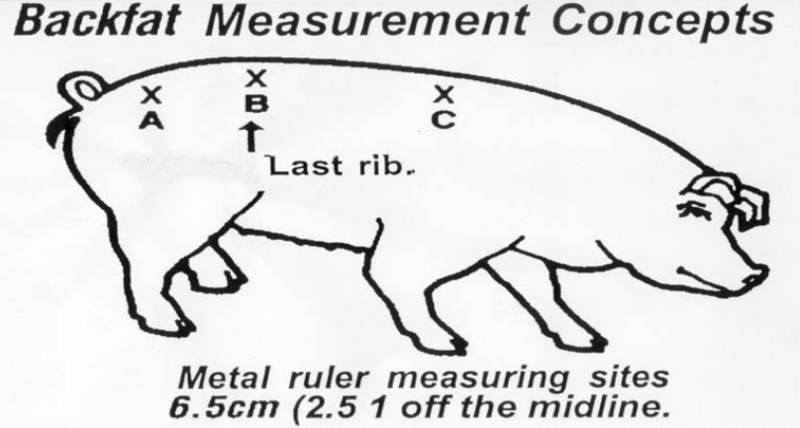 Measurement is from the point of the flank on one side of the sow, over the highest point on the back to the point of the flank on the other side. Then set the feed drop box to the corresponding amount, which is explained below. Set feed box on different rows to each feeder setting (Setting of 3 to 10 lb for once per day feeding and 1.5 to 5 lb for twice per day feeding). Place bag under drop to collect all feed dropped. Weigh the bags on a scale accurate to 0.05 lb. Average the values from each feeder setting to determine a value to place in the chart. – Do at least 5 drops at each setting. Type the slope and y intercept into the cells on the “KSU ME for Gestation” sheet in cells i2 and i3. 9. Print the chart in the “Feed chart, 2 x per day feeding” sheet in the Gestation Feeding Spreadsheet. All sows bred in the previous week should be scanned and their backfat should be written on their feed card. The backfat should be used to adjust their feed box using the above chart. At 7 weeks post breeding, the breeding group should be visually assessed for condition. 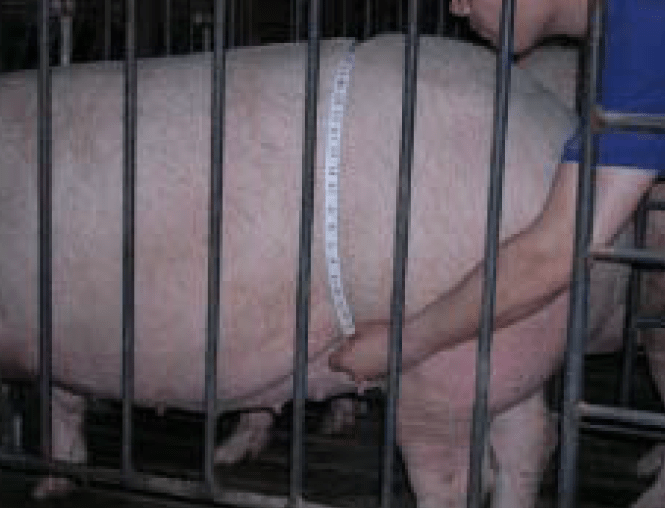 Sows that are thin should be marked and scanned for backfat to determine if they are gaining an acceptable level of backfat. We expect 10 to 15% of sows to be below target gain. If backfat is not above the targeted level, feed level should be increased by 0.5 lb (1 lb/day).